Stamps are from Verve's "Big Wish" set, the banner sentiment (die from MFT) is up on foam tape, the My Mind's Eye Fine & Dandy Girl papers are machine stitched, the edges of the ivory panels were distressed with my fingernail, I colored the image with Copics, and Stickles were added to the cake and flower for extra sparkle. I think I'll send this card to my aunt. Her birthday is coming up next week. Okay, that's it for me today. I gotta get to work now. Have a great Monday, all! Beautiful birthday card! I just realized I don't own that set! ack! LOVE the addition of the rhinestone swirls too! Love what you did with that sketch! I just did the same one yesterday and it's super CAS....lol Must re-visit it and add stuff like you have done here! Fantastic! Just love this, Denise! That sketch is so fun---lots of ways to use some pretty papers! You have been a busy bee, good for you! Beautiful color combination and the bling swirl is fantastic! Wow! What a beautiful card! I love the colors/papers, those crystal swirls, and how you did the sentiment. Such pretty papers and bling! CUTE!! Gorgeous card, love the beautiful papers. LOVE this pretty card and a great use of this sketch! Beautiful coloring! I'm in love with this card!!! Your cake/flower are terrific. . .just simple elegance!! Soooo pretty, Denise! 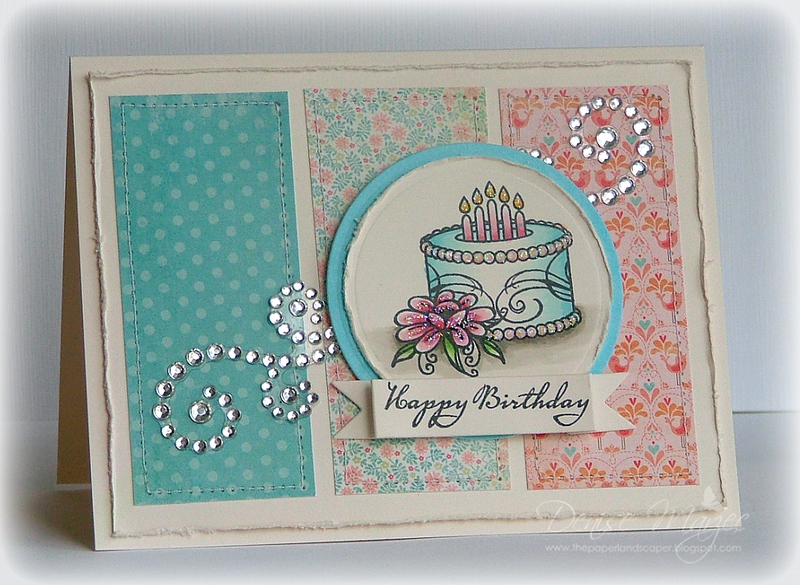 Love the feminine colors, the bling, and the wonderfully colored birthday cake...beautiful! PS You made me tired just thinking about all you have done! 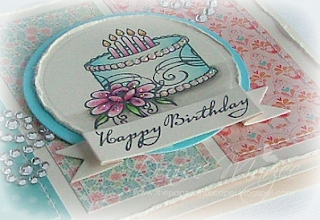 A very sweet card...love the soft pastels you used. Good luck on your painting. I love this layout and the sweet papers you used! Very pretty!! This is gorgeous Denise! LOVE the bling and these papers!